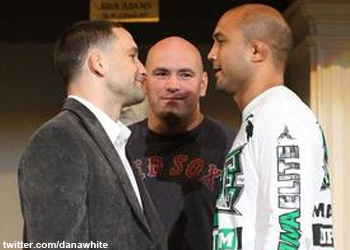 UFC 118 took place Saturday night inside TD Garden in Boston, Massachusetts and was headlined by a lightweight rematch between champ Frankie Edgar and the man he stole the title from merely four months ago, former king BJ Penn. UFC 118 didn’t feature any knockouts, hence no “Knockout of the Night” bonus. UFC president Dana White announced 15,575 fans packed the home of the Boston Celtics, this year’s NBA Finals runners-up ;), and garnered $3 million at the gate. The promoter also reiterated that Gray Maynard will face lightweight champ Frankie Edgar after dominating former top contender Kenny Florian for 15 uneventful minutes. Although Maynard collected his 10th victory in 11 tries (he has one No Contest on his resume), eight have come by way of decision – including his last seven. James Toney and BJ Penn were no-shows at the presser. White stated that Toney was irked he had to wait around too long and bounced, while the promoter was unsure why Penn didn’t attend. Instead of just going for a grounded TKO against the boxing legend, Randy Couture said that he wanted to prove a point by submitting the talkative MMA rookie. White emphasized on multiple occasions that Toney will not be back inside of an Octagon, although he has much respect for his boxing skills. When prodded further as to why the former lightweight king was MIA, White suggested Penn could have either been taken to the hospital to get examined or was too pissed to face the firing squad. As expected, Edgar was gracious and humble in victory. He too was missing for most of the presser, and while White stated he was having issues with the athletic commission, Edgar said he just needed to pee and submit his post-fight drug test.